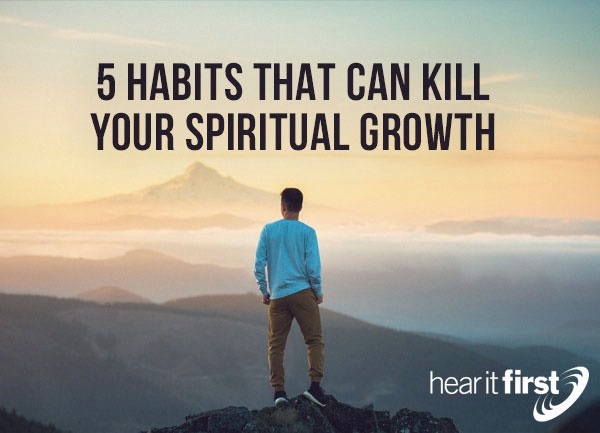 What five things can really wreck or even kill your spiritual growth as a Christian? This is a no-brainer, or at least should be, because we can’t sustain our spiritual growth without intake of the living Bread of Life, Jesus Christ, and that necessarily includes His words. Jesus told His disciples “Abide in me, and I in you. As the branch cannot bear fruit by itself, unless it abides in the vine, neither can you, unless you abide in me” (John 15:4). How much can we do without Jesus’ word? He answers that in saying, “Whoever abides in me and I in him, he it is that bears much fruit, for apart from me you can do nothing” (John 15:5b) and the last time I checked, nothing means “zero, zilch, nada!” Jesus conditions the effectiveness of our prayer life by our connectedness to Him and His word by saying, “If you abide in me, and my words abide in you, ask whatever you wish, and it will be done for you” (John 15:7). Since we now know that we can’t do anything without Christ, we look at the converse as being, “I can do all things through him who strengthens me” (Phil 4:13). When you get into the Word of God every day, the Word of God stays in you during your day, but when you’re not in the abiding in the Word, you’re spiritual growth will be stagnated, if not stopped altogether. I had one man say that he had a very bad temper but I told him that he’s got a very good one. He saw my point. Sometimes anger makes us snap and do and say things that we’ll deeply regret later on… (Like I have done!). What may help is to learn to be content. The Apostle Paul had to learn it. If he had been a hot-tempered man, his witness for Christ would have been lost and by his demanding his rights, he would have been a poor witness for the love of God. Not matter what circumstance Paul was in, and he was in many a hard circumstances, he wrote, “I have learned in whatever situation I am to be content” (Phil 4:11) but how are you supposed to learn contentment? Lots of practice, which means we get to practice holding our tongue, restraining our anger, and being thankful and grateful to God. It’s hard to be angry when you thankful or grateful to God. Having an attitude of gratitude takes us to a higher altitude (heaven!). The Bible commands us to prayer often and sometimes even says, “Pray without ceasing” (1st Thess 5:17) in the sense that we should be constant in prayer, as much as circumstances allow. The Apostle Paul is even more specific in writing that we are to be “praying at all times in the Spirit, with all prayer and supplication. To that end keep alert with all perseverance, making supplication for all the saints and also for me, that words may be given to me in opening my mouth boldly to proclaim the mystery of the gospel” (Eph 6:18-19). Here, in theses verses, Paul list several things about prayer; to pray without ceasing, to be praying in the Spirit, naturally being the Holy Spirit; be praying with perseverance so as to stay alert regarding our spiritual, invisible enemy (Eph 6:12); to be praying for all the saints in the church; to be praying so that the gospel may be praying. When you’re not in a consistent and regular pattern of prayer, you’re (and I’m) telling God, I’m fine without you God, and that’s going to kill our spiritual growth for sure because it cuts the line of communication with God. The qualifications for pastors and deacons list several different requirements and almost every one of them includes the need for integrity. Someone who lacks integrity is likely not self-controlled, disciplines, upright, and isn’t a drunkard and violent man who is only greedy for gain. Paul gives nearly the same qualifications for deacons in Titus chapter 1 as he does in 1st Timothy 3 and all of the attributes of a deacon or pastor must include integrity. Without integrity, not only will the church leader fall and fall hard, but so too will the church member. It is impossible to have spiritual growth without integrity. Head knowledge about God and the Bible cannot replace integrity. It’s a matter of a good night’s sleep or having a restless night, tossing and turning due to a guilty conscience. Solomon wrote, “Whoever walks in integrity walks securely, but he who makes his ways crooked will be found out” (Prov 10:9). The psalmist saw his integrity tied to his preservation as he wrote, “May integrity and uprightness preserve me, for I wait for you” (Prov 25:21). If you are abiding in the Word of God, meaning you’re reading the Bible on a daily basis; if you’re not learning how to be content, which is godliness (1st Tim 6:6), then you’re anger can spring up at any moment; if you’re not being in prayer then you’re not accessing the throne of grace for times of need; if you’re not a person of integrity; and if you’re not generous with what you’ve been given, you’ll find a very lean spiritual life and one where you’ll kill your spiritual growth if you’re not careful and more diligent.